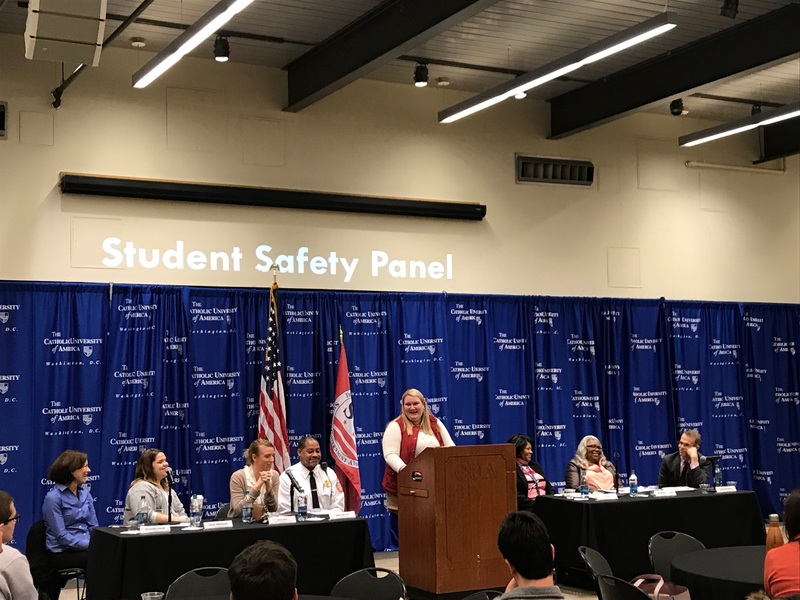 On Wednesday March 14th, a panel of university officials that deal with safety on a daily basis sat down to speak to students about safety on campus. The seven panelists included Dr. Loretta Staudt of the Student Health Services; Sarah Williamson, Associate Dean of Student Conduct and Ethical Development; Amy Kerr, Associate Dean of Students and Director of Resident Life; Barry McCoy of the Department of Public Safety (DPS); Kim Gregory, Associate Director of DPS; Thomasine Johnson, Director of the DPS; and Lawrence Morris, the president’s Chief of Staff and a member of the university’s emergency council. Hosted by the Student Government Association, the panel began with introductions of the panelists and brief overviews of their roles here on campus. Then the room broke out into small group discussions to speak on what they as the students believed is the biggest safety concern on campus. Out of the seven tables, four of them named an active shooter as their primary concern while the other three brought up issues of other students’ risky behavior, student health, and emergency situations in general. Kerr noted that recent emergency situations have helped in adjusting standard protocols when asked about residence hall safety. Kerr added that a point of emphasis for both residence life and the dean of students is the importance of timely and efficient communication between the administration and the students. She used the example of the most recent power outages that occurred on campus on Sunday, February 11th to explain the importance of communication between students and the administration. Although Kerr joked that she “read about the trauma that people experienced with their cell phones not being charged when they woke up”, she also explained that that could inhibit them from learning certain vital pieces of information that could have been sent out electronically. In response to that, residence life staff members, residence assistants, and Community Directors alerted the administration of the outage when they woke up and posted signs throughout the residence halls to notify students. Aside from safety in the residence halls, many of the students questioned safety operations during a potential active shooter situation. DPS Director Johnson went through several procedures during an event of this nature and the relationship between the D.C. Metropolitan Police Department (MPD) and Catholic’s DPS officers. In the event of any emergency event, a campus wide alert will be sent out either telling students to shelter in place or to evacuate their building. After this initial message is sent out and the MPD is notified, DPS will send out another alert with more information to ensure that students are receiving all of the useful and correct information they throughout the duration of the emergency. Each building has an individual watch captain to be deployed to assist students on where to go in case of an emergency. The group is an unadvertised organization that comes out when an emergency takes place, putting on vests to assist those who either missed the alerts or are confused by the situation at hand. Captain McCoy went into department protocol and the joint relationship between the DPS and MPD. “DPS being an unarmed department, our primary responsibility is safety, where we will confirm the situation,” McCoy said. The department’s officers are instructed to set up a perimeter, safety zones, and coordinate with the MPD, whose role is to neutralize the threat as quickly as possible. McCoy noted a study done by the Department of Homeland Security that said an active shooter threat can be taken down in ten to fifteen minutes after the threat is alerted to the authorities. DPS and the MPD have a very good relationship, with police officers constantly visiting campus, sometimes even eating in the Przybyla Center, to ensure student safety. Within the DPS headquarters, there is also a MPD radio which can be used to alert the thousands of police officers throughout the D.C. area to a crisis. SGA President Brianna Howard concluded the evening by thanking the panelists for their time and expertise on the subjects as well as reminding students of the mantra, “Our Community, My Responsibility,” which promotes the idea that students must take an active role in safety on campus.